What Would You Do If Your Child Confessed to Murder? Just over six years ago, a high school student and his parents were killed by an unknown assailant. This happened right here in Lancaster County. What made the case unique was that weeks passed without the police receiving any solid leads. Then, one month later, another high school student confessed to the crimes. But he did so in the confines of a counseling session, and the psychiatric hospital where he was staying turned to the boy’s father, also in the room when the confession was made. “You need to do the right thing, sir,” the counselor told the father, Tim Kreider, inferring that it was up to him to turn in his son. What would you have done, if your son looked like he might be getting away with murder? What would you have done, if your son faced three life sentences? Three years ago, I received an email from a man named Walt Mueller. He said that he knew of someone who had a story to tell, and he wondered if I would be okay with him giving them my details. Soon after that I received an email from a man named Tim Kreider. He said he had written a story about what he had been through recently when his son confessed to murdering his best friend and his best friend’s parents. He wondered if we could meet. For some reason I think it was in the fall. I remember standing outside the front door, waiting, wondering what Tim and his wife Lynn would be like. I’d never met the parents of a murderer before. Tim answered the door and shook my hand. Lynn gave me a hug. Tim has changed a lot since that day when I first met him, and on that early evening, in 2010, he had very sad eyes. While he was eager to tell his story, there was a subconscious reluctance, a hesitancy. He knew that if he was serious about telling his story, he’d have to revisit emotional spaces he preferred not to visit again. At the end of the evening he asked if I would take a look at what he had written. He reached down and brought up a folder filled with over 300 pages. He asked me if I would read it. It was a very rough draft, he said, something he wrote in a heavy, dark place, but the writing of it had been one of the keys to helping him find his way after what his son had done. Over the last three years we have rewritten it, polished it up a little, added sections previously forgotten. There were large chunks of time where the story lay dormant – things resurfaced, made the writing too difficult for Tim. Times when he needed a break, or when the business of life took over. But it is finished now, the story of a man whose son admitted to a terrible crime, and the decisions Tim was forced to make. It’s a powerful story, one full of redemption and hope. 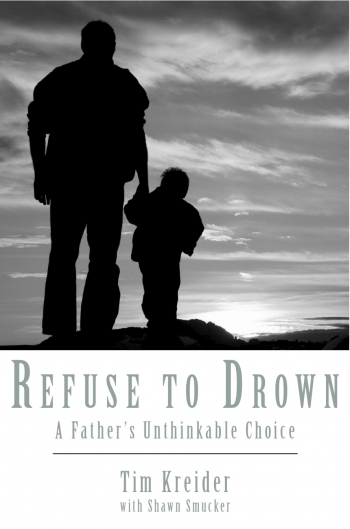 If you’d like to find out more about it, please go and “Like” our Facebook page, Refuse To Drown. Or you can check out our website and sign up to be notified when the book releases, on or around February 1st of next year. Thanks for supporting this, my latest venture. You folks have been such loyal readers through the years, and I’m really proud to bring you this incredible story. If you would like Tim to share his story at your church, please let me know. If you are a blogger and would like an advanced copy of the book to review on your blog during the week of February 1st, 2014, please let me know. When I sat down to read the book I felt myself being drawn into the story and could not put it down. As I read the part where they had their last meal together as a family I wept as they all realized they would never be able to do this again! It was a very powerful and emotional read for me. What an incredible thing to do….I can’t imagine. Oh, wow. I plan on reading this book for sure. I’ll be sure to get you an advanced copy, Leigh. Can you email me your mailing address? Wow… what a haunting story. Looking forward to reading it. If you still have copies left, I’d be interested in reading and reviewing. Thanks, Amy. I’ll add you to the list. Should have advanced reader copies ready in a few weeks. I know nothing about this event and I am already feeling the strenght, hope and power that this story might have. I would like to know when the book is out so I can read it.